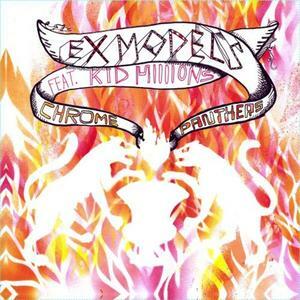 Ex Models – Chrome Panthers | NoCoda. What It Sounds Like: Straight up clanging noise kids want to prove to you that no-wave actually has some artistic merits. They fail. Look, I’m an open minded guy. I like stuff that pushes the boundaries. More than even that, among many different musical styles, I like noise! I like crazy distortion, flip-flopping time signatures, and the scream of a lead vocalist who may either be 1) in a ton of pain or 2) giving the performance of his life. This begs the question – how do you distinguish between “good noise” and “bad noise” rock? It’s all personal preference, of course. I may give something a glowing review, and you’ll find it super lame. That’s ok. I may hate on a record (as I’m about to do), and you may find some good qualities to it. That’s great! Here’s what I can’t stand in a record, especially in the noise genre: excessive repetition. First off, you’re trying to be experimental anyway, so why not change it up? Why create the exact same noise throughout a whole six minute track. and then promptly title it That’s Funny I Don’t Feel Like A Shithead? That’s funny man, cause you kind of are! There’s nothing deep about that; nothing introspective. It’s just repetitive noise, and I don’t see any sort of quality in that. Noise that changes it up and gives us a variety? I understand you. But the same thing over and over, droning on and on? What’s the point? The first half of this six track, twenty seven minute record is terrible. Mutiny clocks in at just under seven minutes, and it’s a seven minutes that you are never going to get back. The noise isn’t even interesting – it’s just there – and it’s just boring and harsh. The second half of the record shows some improvement, but not enough to warrant any sort of serious recommendation. Buy American gives us a minimalist backdrop with a terrifying guitar screetch over the top of it that is enough to drive you off the side of a building. Headlines and Chrome Hearts offer up a little more (a little more, I said) diversity, but again – not enough to earn them any sort of saving graces. 1) Put this record on. 2) Get out your paintbrushes and all your paint. 3) Get out a huge piece of paper. 4) Throw away your paintbrushes. 5) Dump all your paint all around the paper and let it dry. 6) Hang it up on your wall and sign it. You’re an artist! Expression! No rules! If you don’t get it, screw off! I’m not buying that painting or your sincerity. I’m also not buying into Ex Models or their Chrome Panthers release. Sameness rocks … except for most of the time. Noise? Awesome, except when it’s just noise. Your rant really resonates right now. Can you tell? Thanks for beating up on the uninteresting practitioners of what can be a really cool musical neighborhood! David, I think you and I would get along just fine!